A month ago, we noted the unprecedented amount of uncertainty surrounding the equity markets. Those concerns still remain today, but many of them have transformed from worries into reality. Stock prices have moved to reflect this transformation and then some leaving many to wonder when the panic trade will subside. The credit crisis has grown from a weight around the neck of the economy to a potentially crippling global epidemic. Likewise, we have witnessed some of the largest and most prominent financial institutions struggle with solvency. I think it is fair to say that the most horrific fears voiced by the doomsayers have progressed. The result is a completely different trading environment and accordingly a new set of rules. We also mentioned in the last newsletter that there is an extraordinary amount of cash sitting on the sidelines waiting for mutual funds and individual investors alike to put their money "to work" in equities. At the time, equities were trading at technical and annual lows and seemed to be relatively attractive for new money to be injected into the markets. We know now that this theory was based on the false assumption that investors still had a shred of confidence in the system as we know it. The price of gold and the value of the S&P 500 have now crossed paths to suggest that investors are highly discouraged by the prospects of the future of our financial system. It is clear that the average investor simply isn't comfortable with the risks and lack of market performance and has been in liquidation mode. Likewise, hedge funds and mutual funds are being met with redemption notices courtesy of the lack of confidence by retail investors adding fuel to the fire. There are now questions circulating as to whether or not the average investor will ever find the courage to come back to equities but we are not buying into this theory. Keep in mind that there is over $50 trillion of sidelines assets and that could potentially filter back into the markets. It may not happen today, or tomorrow but with market stability and credible governmental policy there is a chance that it will eventually make its way toward stocks. I have found that it doesn't pay to bet against history, and history suggests that the markets can and will eventually bounce back. With that said, traders (as opposed to investors) are working on a much shorter time horizon and should keep that in mind. Unfortunately, in my communications with industry insiders and clients I have seen and heard some pretty horrific stories regarding the carnage that recent market conditions have caused. I can tell you that many of the "big boys" on the floor have taken to the sidelines are reluctant to voice their opinion on the possible direction of the market out of fear that someone may act on their comments with devastating results. I am not going to pretend to be smarter or better than the pros standing in the middle of the action. After all, they are privy to much more information that most and in a much more timely manner than most. If they are standing on the sidelines, that is probably the best place to be. "Take it from me; picking a market bottom is next to impossible. It is important to understand that while things are looking gloomy now, they can, and in my opinion likely will, turn around sharply and without warning. Whether you are bullish or bearish in the near term, the potential of the aforementioned should be in the back of your mind as you determine a trading strategy. " There are affordable ways to play the market with limited risk and unlimited profit potential. This market can and will rally as the shorts begin to cover, and the upside projections are promising. If you want to be there if and when a reversal occurs but aren't interested in the pain and suffering involved with trading futures or short options in this irrational environment, it may be a good idea to purchase a few lottery ticket plays. I like the idea of buying e-mini S&P and NASDAQ call options as well as mini size Dow calls for about $300 or less. Contact me for strike prices. In Friday's session the VIX traded above 70 for the first time in history. While we have never before seen such elevated volatility, we have seen spikes in volatility in the past and they tend to be short lived. The markets will calm down and will eventually provide reasonable risk reward ratios. Don't turn your back on the stock indices forever, but do take a break. Watch for updates in The Stock Index Report. The Treasury market has been manipulated by the credit crunch. In the last couple of months we have witnessed all time low, or near all time low, yields in Treasuries across the curve as a flight to quality bid brought safe haven buyers to the market. Subsequently, interest rate products underwent a sharp and hasty reversal largely due to the need for firms and individual investors to raise cash in light of tight credit conditions. The cloud of questionable fundamentals leads me to put even more emphasis on the seasonal and technical aspects of the bond market. Based on historical standards, bonds tend to trade weaker in the first three weeks of October but trade choppily higher through November. Knowing this, it seems fair to say that the bulk of the recent Treasury plunge may be nearing an end...at least for now. A monthly chart of the 30 year bond reveals the big picture. For a majority of the 2000's, bonds have traded between the mid 120's to the mid-100's. Basic charting of support and resistance suggests that the overall target may be near 105. However, it would likely take several months for this to materialize. 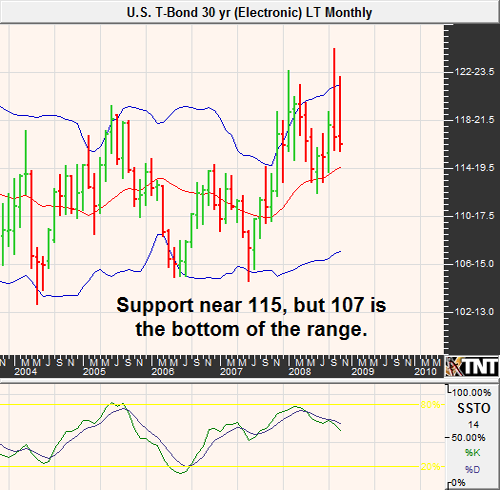 In the near term, I am looking for the long bond to reach a temporary low near the mid-115's. At this point, selling puts or buying futures may prove to be promising. Keep an eye on the Bond Bulletin for specific recommendations. 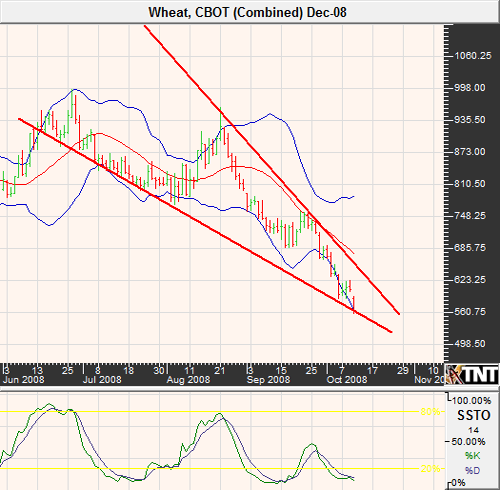 Commodities, the grains specifically, continue to baffle many traders. Just as many were coming to terms with the new world of inflated commodity values; it has all come crashing down. I think that it is fair to assume that as the global equity plunge has played a big part in the commodity collapse in the form of forced hedge fund liquidation and trepidation of the economic climate and future demand for products. Stabilization in the stock market could lead to a similar recovery in commodities in the coming weeks. In the previous DeCarley Perspective, I was anticipating commodity prices to find their harvest lows in early October. Since then, a dramatic counter-seasonal move has ensued destroying anything and anyone in its path. If you also recall, I pointed out that the risk of speculation in grains have been magnified and that remains accurate. The new economic environment has resulted in significant decreases in demand as well as a stronger dollar. 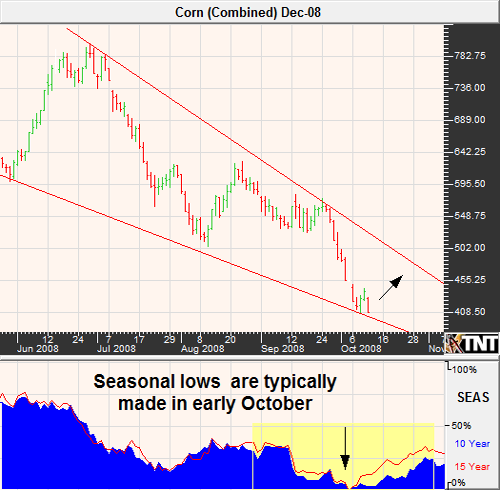 With both forces working against the price of commodities, corn has tumbled nearly 50% from its 2008 highs. It is important to note that supply and demand fundamentals were the original culprits to voluntary selling. However, in recent weeks floor brokers have noted that the liquidation in corn and other commodities has stemmed from hedge fund redemption requests and margin calls. In other words, the selling has become forced and may or may not reflect that actual opinions of the marketplace. In the world of hedge funds, they typically have a 30 to 90 day "grace period" in which clients requesting to withdrawal funds can expect to be waiting to get their money back. During this time frame, funds are looking for what they believe to be opportune times to unload positions. The process can be relatively orderly in normal circumstances but this time around has grown into a snowball of liquidation. In the end, selling holdings leads to more redemption requests and eventually even more liquidation. With that said, it seems as though the bulk of the hedge fund industry has liquidated and in theory this may indicate that the forced selling in commodities and stocks may be nearing an end. However, that doesn't mean that voluntary sellers will be ready to cease as the damage has been done and panic has taken over. The bearish news in corn seems to be out in the open and priced into the market. Friday's crop production report confirmed better than expected supplies and the sluggish global economy confirms lightened demand. Sometimes markets fail to follow through on fundamentals given that technical price action often leads the news. The December corn futures contract is trading near $4.00, the pre-established floor, and it seems to be coinciding with technical trading range support. Also supporting the theory of a temporary price recovery, the harvest lows may have come a bit late this year due to hedge fund liquidation but that doesn't mean that the market won't find a low. Corn isn't the low leveraged, relatively low risk grain that it used to be and catching a falling knife can be a risky proposition. Play this market with caution. Soybeans weren't spared aggressive hedge fund liquidation but with prices approaching $9 per bushel, the bean complex may be due for an oversold bounce. This assumption is evidenced by trend line support, the yet to be seen harvest lows and extreme pricing as noted by Bollinger Bands. Similar to corn, the harvest lows in soybeans are typically seen in late September and early October. While the typical window of opportunity may have passed, it may not be completely closed. Bollinger Bands represent two standard deviations from the market's average price. Those privy to statistics realize that two standard deviations signals extreme prices in which the odds favor that the market trading within the range of the bands. 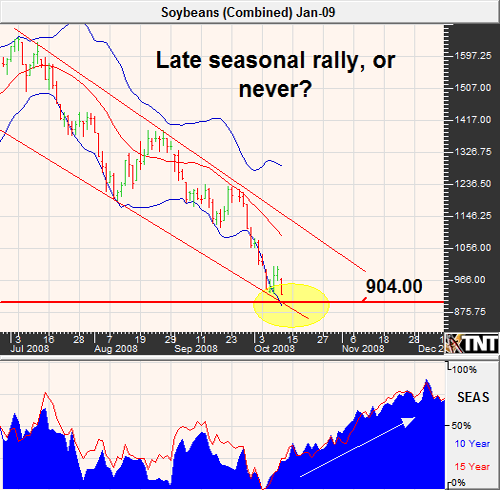 Given Friday's increased production estimates, there seems to be potential for lower bean prices. However, we argue that a temporary low may be setting up and see $9 as an opportune time to be cautiously bullish. Amid the wave of fund liquidation, wheat prices have tumbled nearly 60% from their 2008 highs. 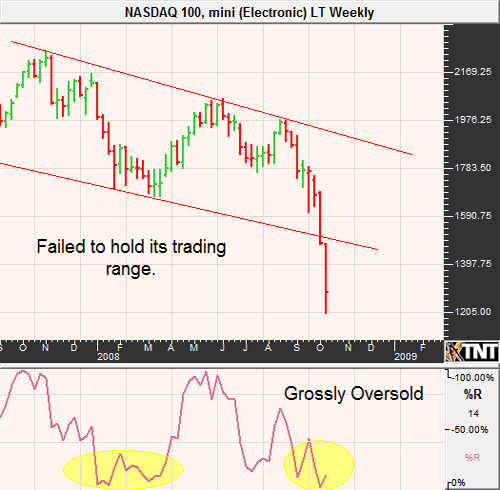 The complex is clearly oversold, but any potential technical bounce may have difficulty sustaining itself. If you chose the play this market from the long side, I recommend avoiding long term positions. There is potential for a technical rally to nearly $6.85 assuming resistance near $6.20 is broken. However it may take the help of a global equity market recovery in which commodities are along for the ride. Unlike Corn and Beans that tend to find seasonal support during this time of year, CBOT wheat prices often finds a seasonal peak and trade moderately lower through December. I lean to the long side here but don't see enough compelling information to be willing to recommend a long term commitment; bullish trades should be short and hopefully sweet. There is no doubt about it; crude oil is an exciting and potentially lucrative market. However, it can also be a market in which great despair can and will occur. The move from the summer peak to current pricing represents about $65,000 of profit or loss per contact. The same move to a mini trading would have been equal to $32,500. As you can see, it takes deep pockets and a lot of guts to participate in crude oil speculation. If you have the margin and the fortitude I commend you; however, I feel that the average retail trader would be much better off using limited risk option spreads. This can be done through the use of an Iron Butterfly spread (if you are unfamiliar with this strategy, be sure to read about it in the Option Trading e-Book located in the premium content section of DeCarleyTrading.com). If you would like to play the upside or the downside in this market and would like help putting a limited risk spread together, give us a call. In last month's newsletter, we were calling for a short covering rally in the November contract to $111 per barrel and possibly as high as $121. As it turns out, we were a bit early in our call but the market did in fact retrace to the stated levels. From there the rally failed and eventually made way for one of, if not the, largest drops in the price of crude oil in history. Similar to many of the other commodities in this report, we are expecting the market to relieve itself from oversold conditions in the form of a short covering rally. 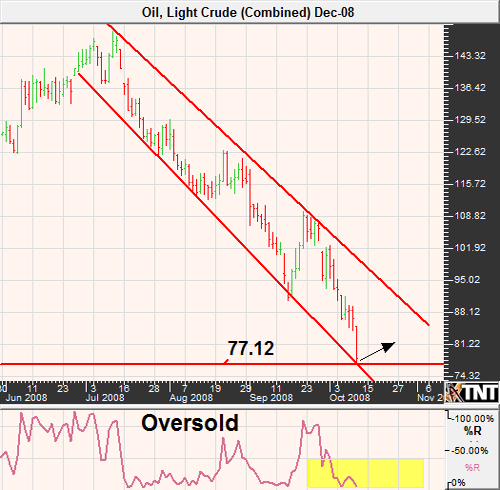 I see the potential for December crude oil to bounce to the $90 - $95 range in the coming weeks. Once again, this will be highly dependent on political developments in Washington and the subsequent equity trade. Keep in mind, the sudden plunge in oil prices has sparked a bit of a panic in OPEC. As recently as Friday, there were widespread concerns over voiced intensions to reduce production and support energy prices. Many analysts were surprised to see the price of gold hover while television pundits and stock investors were portraying a vivid image of the end of the world as we know it. Perhaps the hedge fund liquidation simply wasn't as evident in this market as many retail traders were on the buy side of things. Or maybe this is another sign of an overreacting equity market. Either way; in light of monetary policy uncertainty and the event risk involved with being involved in this market, I don't see enough evidence for to be either bearish or bullish at current levels. 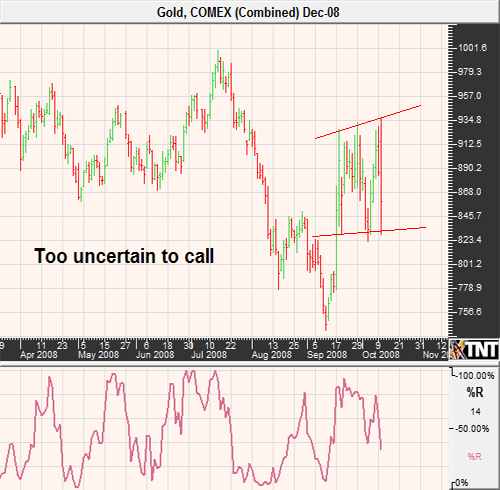 We made a good call in gold last month but are having difficulties putting the pieces together this time around. We prefer to recommend the sidelines. 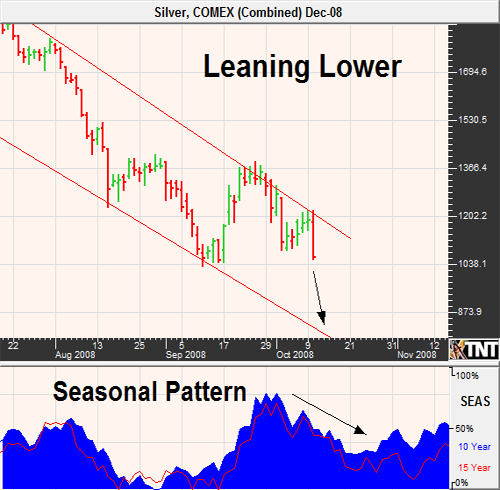 Silver traders should strongly consider the seasonal tendency of the metal during this time of year. While prices at or below $10 per ounce seems like a bargain compared to where we have been, the market could have a difficult time overcoming technical and seasonal pressures. When it comes to silver, we are leaning toward the bear camp in the near term. The dollar index has been consistently forging gains despite the naysayers. Our projections of a pull back in the dollar along with a subsequent rally to the 85 area have proven to be surprisingly accurate. After pulling back to 76 on the dollar index, the December futures rallied sharply to settle at 83.31 on Friday's close. I remain mildly bullish the greenback, but once again the markets seems to be overbought and due for a pullback. 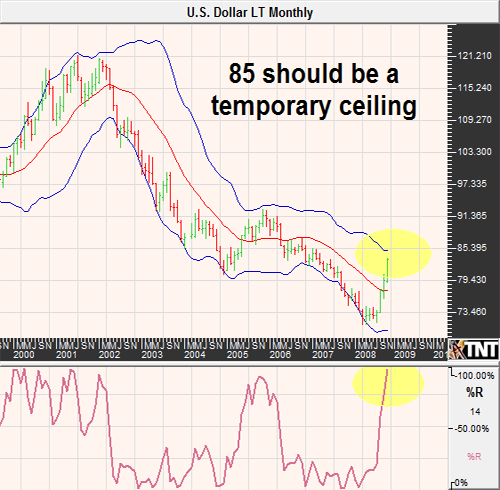 Looking at a monthly chart, it seems like the Dollar is still targeting 85 and may see it in the coming days. However, I question its ability to hold such levels as the week progresses. Keep in mind that about 60% of the dollar index is weighted against the Euro which seems to be setting up for a corrective rally based on internal analysis. We are looking for a pullback in the U.S. dollar index to extend itself to 79 and depending on political policy surrounding the credit crisis may even see levels as low as 75 in the coming weeks or months. The Euro has been a victim of the new global environment. 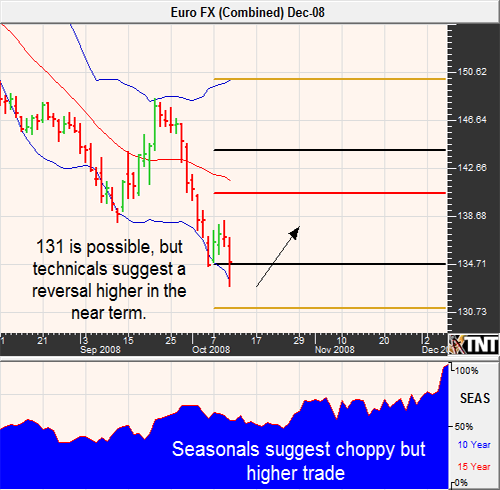 As the credit crisis emerged as a worldwide epidemic the Euro quickly fell out of favor of currency traders. The result was a breathtaking 1500 plus point drop spanning a few short weeks. While many are calling for the Euro to be at par with the Dollar, it seems as though things have moved a bit too far too fast. We are looking for a correction to ensue that would bring the value of the Euro back to the 140/141 area before continuing to make its way lower. The British Pound has found itself trading at a nearly three year low against the U.S. Dollar leaving the currency slightly technically oversold. While it appears that there may be a bit of room for the contract to move on the downside the British Pound will soon be due for a corrective rally. 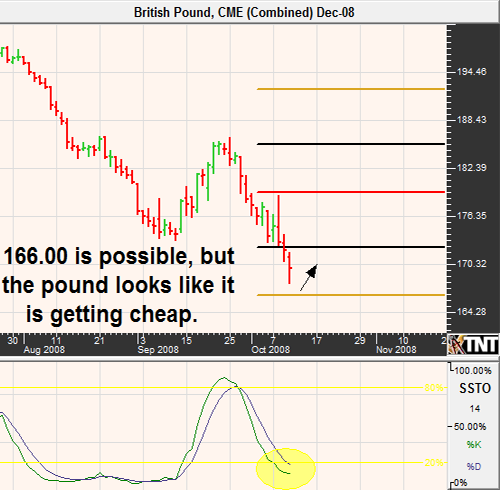 Should our analysis be accurate, we may see a move from the 167/168 area to 172.70 and possibly even 179.50. 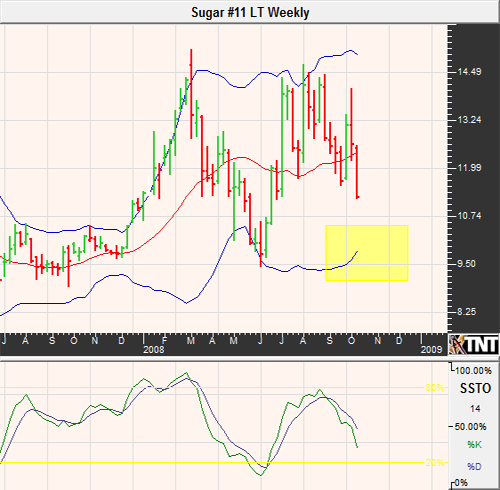 The month of October has been disastrous for sugar prices. In a plunge beginning September 26th, the March sugar futures contract has plummeted nearly three and a half cents. Weaker crude oil and biodiesel component bean oil weighed on the "ethanol" story that lead to higher sugar prices in the first place. In last month's report, we were recommending buying cheap out of the money calls with expiration dates well into 2009. It is now obvious that we were either too early or simply wrong. However, if you sill like the bull case in sugar this is an even better time to be buying call options at a bargain. In previous writings, we warned of the volatile nature of coffee and the potential of a swift and large price move once the trading range was violated. In the last several weeks, coffee broke support outlined by a multi month trading range between 148 and 136 and never looked back. 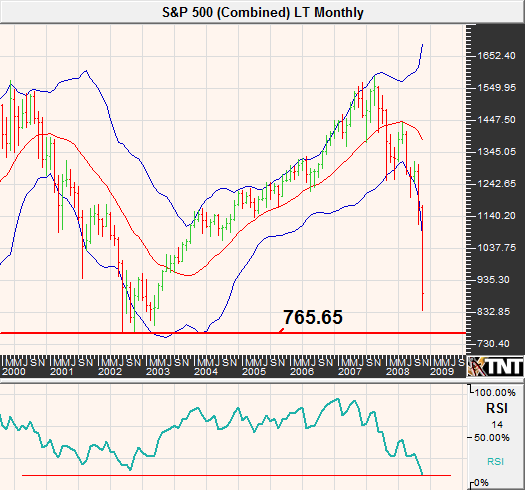 Historic lows forged in 2001 have been followed by a gradual, but rather erratic, rally. 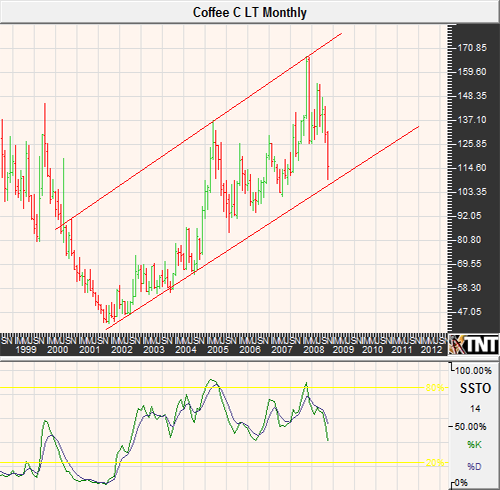 Despite a few quick spikes higher, coffee prices have remained consistently below $1.40 since 1998. The monthly chart suggests that we are near trend line support and another run at the highs may be in the cards. 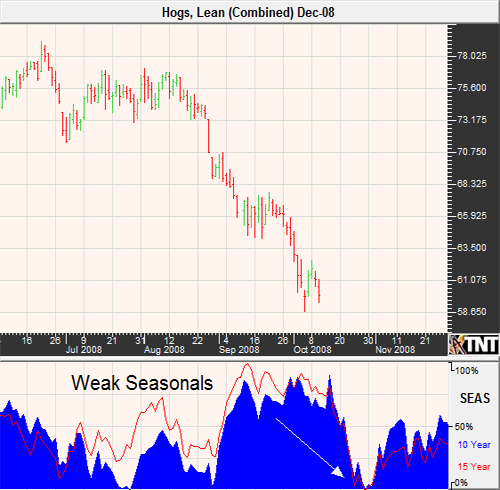 Additionally, the seasonal tendency is for coffee prices to "grind" higher into the month of December. However, beware of the potential for a retest of $1.00 before the rally ensues and beware of incredible resistance near $1.40. Coffee is a high stakes market, the options are expensive and the futures margins are high. Before entering this market, make sure that you are able to tolerate the risk involved. If you thought that hog prices were cheap near 65 cents, they must really be attractive to you nearly 30 days later and 10 cents lower. Keep in mind that hog prices have been confined to a range between 50 and 80 cents since 2003 and the closer that prices get to the 50 cent mark the higher the odds of buyers finally stepping in to stop the "slaughter". We don't pretend to be experts in the meats, but we have been following this market long enough to have a keen understanding of the mentality of meat trade. I have found that being overbought or oversold doesn't mean as much in the meat trading pits as it does in some of the other commodities, especially the financials. The market can and does remain at extremely overdone conditions for long periods of time. Also, seasonal tendencies point toward continued weakness. Therefore, it isn't recommended that the bulls trade this market aggressively. The bid ask spreads aren't favorable for option spreads, so perhaps simply buying cheap out of the money calls is the best play. Likewise, if you prefer trading this market with long futures, I highly recommend hedging your bet with the purchase of a protective put. Contact me for ideas and details. In the summer of 2008, December cattle touched near $1.15 and then fell back. The contract simply hasn't been able to regain its allure as prices have been consistently moving lower. In recent weeks, the selling pressure has been exacerbated by the financial crisis and the commodity meltdown. Trade has taken a counter-seasonal path in the previous four weeks of trade. It is important to realize that seasonal tendencies are a rule of thumb not the Holy Grail. Additionally, when a market does move counter to its seasonal norm, it is often a surprisingly large and rapid move. This is exactly what has taken place in the cattle markets. Interestingly enough, while prices plunged during a typically strong time of year we are approaching a seasonally weak time of year as prices seem to be nearing a historical low. 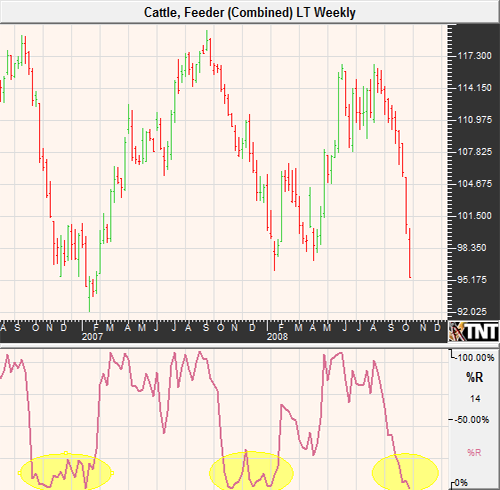 Feeder cattle prices are now trading near the 2008 and 2007 lows, from both of which the market subsequently rallied. Should the financial markets find stability, the commodity markets may follow and cattle may be a beneficiary.